It’s around dinnertime in a downtown Calgary bar, and Jeff Ballingall is boasting. He’s taken a break from his stomping grounds in Ontario to attend Stampede, Calgary’s great, rowdy cowboy costume party and rodeo. Earlier in the day, he’d seen Alberta’s NDP premier Rachel Notley go by in the Stampede’s parade. He booed. (A member of the premier’s staff said she didn’t hear any boos.) He seems to take pride in riling up a crowd. Ballingall is the force behind Ontario Proud, a conservative-leaning Facebook group. It is not formally affiliated with the Progressive Conservative Party—or any political organ—but, in only two years, it has developed an audience large enough that the group can credibly claim to be as influential as many mainstream news outlets on social media. (Ballingall himself has not been shy about taking a slice of the credit for helping to defeat Liberal premier Kathleen Wynne during the last Ontario election.) CBC Toronto is liked by about 150,000 people on Facebook; Ontario Proud—run by Ballingall, a video editor, an intern, a few freelancers, and a junior consultant—has been liked by more than 390,000, and its content reliably racks up hundreds more comments, likes, and shares than the news stories posted by established outlets. 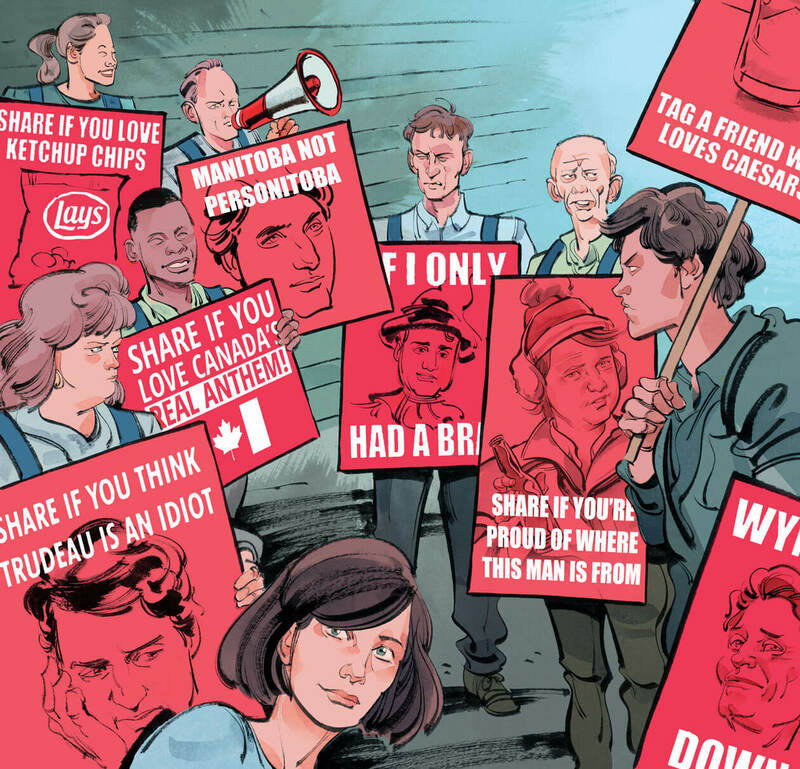 Although the group’s real-world influence is difficult to quantify, Ballingall will happily supply engagement statistics that he says suggest Ontario Proud’s easy, memetic content is reaching millions of people. It has ambitions to reach many millions more. Ballingall plans to expand his model and says he is working with teams in Alberta, British Columbia, and Quebec to form similar groups. Already, he has set his sights on Prime Minister Justin Trudeau. Ontario Proud has been dismissed as a Progressive Conservative astroturfer: a third-party advertiser that deliberately mimics the aesthetics and style of grassroots activists. As such, it can easily flout notions of accountability that hem in political parties. (Ballingall disputes the characterization.) A third party, for example, can make misleading or inflammatory statements that a mainstream political party would consider too risky. Ontario Proud can call an NDP candidate a “nutjob” without fear that such incendiary language will reflect poorly on the Progressive Conservative Party. Third-party advertisers run the gamut, from unions or advocacy groups like the Animal Alliance of Canada to the Canadian Nurses Association and the Ontario Korean Businessmen’s Association. Many have a well-defined public face: unions have members and organizing committees; professional organizations generally publish staff and board lists. Ontario Proud’s financial records have not yet been made public. Ballingall says 1,300 donors both big and small have contributed funds to what was once an out-of-pocket bootstrap organization. A PowerPoint presentation leaked to The Walrus this summer showed that Ontario Proud was seeking $700,000 in funding to “inform,” “influence,” and “mobilize” voters ahead of the 2018 election—roughly the spending limit placed on third-party organizations in Ontario. In other words, a really savvy social-media manager who has a talent for the viral hit—someone like Jeff Ballingall—doesn’t have to spend very much money to influence and reach people. In a political and media landscape where cash is traditionally traded for attention, this gives groups like Ontario Proud an enormous advantage. The concern is that these groups create echo chambers that insulate the electorate from competing points of view, debasing the political process and creating shrill, clashing hordes that can’t find common ground. “You won’t believe this crazy NDP Policy,” reads the title of one of Ontario Proud’s most popular videos. Ominous music plays over a series of stock videos and photography. “Andrea Horwath and the NDP will declare Ontario to be a sanctuary province,” reads a script onscreen. “It means anyone can illegally cross the Canadian border,” insists the clip, shifting to a video of a nurse’s station, “and get taxpayer-funded health care and social services in Ontario.” That video generated over 4,000 comments and 40,000 shares. Ballingall’s content generates enormous interest. It also generates a great deal of controversy among those who believe his wares are partisan, misleading, or outright racist. Lawlor notes that Ontario Proud seems to produce two kinds of content. There are the benign, positive messages: “Like if you know who this is,” reads a message stamped on a picture of country singer Shania Twain. “Share if you’re proud she’s from Ontario.” But then there are much more pointed messages. Elsewhere on the Facebook page, a video—“Top 10 stupid things Justin Trudeau has done as PM (so far)”—which shows him dancing to bhangra music while wearing a kurta and notes his government’s payment to Omar Khadr. Ballingall and his message are getting louder and stronger. With little prompting, he pulls out his phone to show his latest stats. (He does this often.) Ontario Proud has had some of its best-ever weeks since the last Ontario election ended, he says. “In the last twenty-eight days, 17 million people reached. Post engagement up 101 percent since the election, post engagements 9.1 million!” With numbers like that, Ballingall is ascendant in conservative circles. He has earned the influence and control that long eluded him in more conventional streams of media and party politics. Kagan McLeod has done artwork for the Washington Post, Time, and New York magazine.